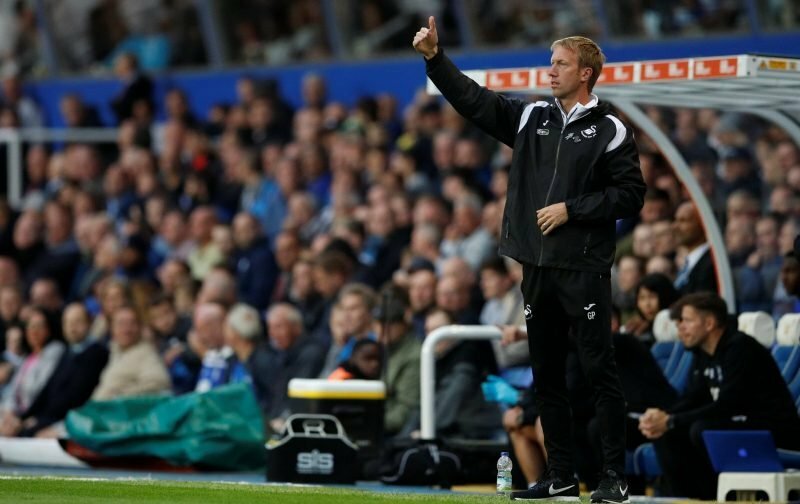 Swansea City manager Graham Potter’s patience is finally starting to pay off as his side are now beginning to show the true value of passing out from the back on a consistent basis. During the glory days of Roberto Martinez, Brendan Rodgers and Michael Laudrup, Swansea City fans applauded a back pass to the goalkeeper but not so much this season having lost our way in the last few years in the Premier League. Passes in tight areas of the pitch in our own third and those played back to the goalkeeper are often met with a fair share of groans having been more used to a pragmatic and direct approach as we tried to firefight our way against top-flight relegation. But as has been the desire from his very first day as Swansea City manager, Graham Potter is trying to re-establish those ‘glory’ days, the ‘Swansea City Way’ and while ‘glory’ might not be the best choice of words given our current predicament, the football on the pitch is at least something for us fans to enjoy. Unless you’re a master like Marcelo Bielsa who’s done an incredible job at Leeds United in implementing his own style to great effect from the very first competitive game of the season, it tends to take some time on the training pitch to establish and learn that philosophy of playing out from deep. Confidence is another key part of it too. For the likes of Joe Rodon and Connor Roberts who were used to it at under-23 level, some of the more senior players have had to refresh their memories. Mike van der Hoorn is now playing some of the best progressive passes from deep in the division but under the likes of Paul Clement and Carlos Carvalhal, he was a ‘hoofer’ then in comparison to now. Often looking for the chipped forward pass to a bigger striker dropping deep, the former Ajax centre-back is now playing some superb low passes into feet, breaking through the opposition’s half to get his side on the front foot. The video clip below is a great example of this and he’s proved to be a key component of Potter’s football philosophy. A defender who’s the man to get the ball to in deep positions. Cameron Carter-Vickers has often been the safe passer at the back while the Dutchman has looked to drop into positions to play line-breaking passes, doing so with great accuracy. Another one from the same game, van der Hoorn (below) drops deeper after playing a pass, attracting a four-man press before making another successful forward pass that breaks through the opposition. Nathan Dyer is often the player dropping into that narrow inside channel, off of his wing, making a first-time backwards pass which helps to keep the ball moving forward as these backwards passes, as Potter has mentioned recently, attracts the press and allowing more space to open up further up the pitch. As soon as Dyer drops in to make these passes, he can make forward runs down the flanks as the Swans look to make vertical passes over the top. “But this is the challenge, because we can talk about identity but if you’re losing 1-0 or 2-0 at home and you make a backwards pass [to invite the opposition press], because you want to play through teams, it’s not greeted with universal: ‘We’re working towards our identity here.’ ‘Identity’ and ‘philosophy’ are words that, if you’ve not won, there’s quite a lot of people that don’t care about that. After struggling to make this sort of football work earlier in the season, it certainly looks like it’s starting to click. The confidence is definitely there and we’re also committed to a more intense press so if possession is lost in their own half, which it inevitably will at times, then they’re working quickly to regain the ball and avoid conceding a goalscoring opportunity from it. Great example of "Potter-ball" vs #BrentfordFC ????️???? You could say that this was against two poor sides in Brentford and Middlesbrough but we also did this against the best of the lot – Manchester City who, despite resting the likes of Aguero and Sterling, still had plenty of talent in the starting eleven. Fans might question Graham Potter’s decision in bringing back Kristoffer Nordfeldt in goal but we’ve seen in recent weeks the main reason for his return to the starting eleven. Like Guardiola, Potter wants his goalkeeper to be like an outfield player and offer the passing quality of one. It was why he put Matt Grimes at centre-half against both Manchester City and Brentford. You will have seen in some of the previous clips how Nordfeldt is involved in the build-up play and unfortunately, at this moment, Erwin Mulder is not capable of making these quick, first-time passes into the right areas. So like I said, there’s still some groans to be heard at the Liberty Stadium when passes are played backwards and an opportunity to play it forward is missed but as these clips show, who knows, maybe a goal is just 8 or 9 seconds away!? Hopefully, more and more fans start to buy into this type of football again because when it comes off, there’s nothing quite better than it really, is there?